The Short Version: Online dating can seem intimidating to singles, but some experts have figured out how to find a match quickly and effectively. Damona Hoffman, a certified dating coach based out of Los Angeles, met her husband 13 years ago on a dating site, and she argues it wasn’t luck, but strategy, that led to her happily ever after. Focused on personal branding, Damona has figured out the optimal ways to flirt with your crush and secure a great date. She shares her dating insights and over 12 years of coaching experience with a global audience via virtual tutorials, online products, and a weekly radio show. From creating a dating profile to texting after a first date, Damona provides step-by-step guidance for singles eager to start their love stories. Feeling time was of the essence, the single woman enlisted Damona’s help devising strategies to find the right guy for her. A few months later, she met a man who wanted the same things in life that she did. They were married within a year, and the next year their son was born. In 2011, Damona Hoffman left her job at NBC Universal to become a full-time dating coach. Damona is a business-minded dating coach who takes a tactical approach to helping daters attract the right sort of partners. For online daters, she dives into dating profiles and assesses the best photos and wording to present the person in an authentic, targeted, and irresistible way. Her four-step online programs highlight her expertise in attraction and relationships with clear advice delivered via quizzes, audiobooks, ebooks, and exercises. Additionally, her Dates & Mates radio podcast addresses the challenges of modern daters in an entertaining and informational weekly show. From start to finish, this certified dating coach’s guidance leads commitment-oriented singles to quickly find themselves a match, sometimes by going outside their comfort zones. As a multiracial person, Damona emphasizes openness and acceptance in the dating world, pushing singles to think outside the box when approaching potential dates online or in person. Damona grew her understanding of personal branding and ways to make a great first impression while working as a casting director in Los Angeles. She saw people making the same avoidable mistakes, so she decided to help by offering classes on how to nail an audition. She taught actors to market themselves so they stood out to casting directors like her. Then in 2001, online dating came on her radar. She was single and adventurous so she dove right in. “I really had a knack for profile writing,” she explained. “It’s the same as an audition. You need to tell your story and be unique.” Within two years, she’d met her husband on a dating site and felt she was onto something. Soon Damona was helping friends and family replicate her success by tweaking the wording and photos on their dating profiles. She felt gratified by each match made using her tailored techniques. The advice she gave actors going on an audition also applied to daters meeting a potential match. To her, the key to dating is honing the image you present to people and strategically targeting your desired audience. After spending years coaching online daters on the side, Damona decided to follow her passion, leave her job at NBC Universal, and become a certified dating coach. Now, more than 12 years later, Damona offers her dating expertise via personalized online programs and lively radio shows. Her content recommends concrete dating strategies to give singles more control over their love lives. As online dating’s popularity grew, more singles came to Damona with questions and challenges, so she built online programs to address them all. Her dating courses come in four stages — the best one for you depends on your level of commitment to finding commitment. From testing the waters with a fun quiz to diving into an intensive 30-day course, these training exercises provide supportive materials for daters of all types. Damona’s incisive Love Quiz helps singles understand their dating strengths, shortcomings, and patterns. Want to find out what your love story type is? In 10 simple questions, you can gain insight into your relationship style and what challenges to watch out for. For example, my results told me I’m idealistic, secure, and critical in relationships. All very true. By knowing yourself and your dating patterns, you can start to correct negative behaviors and seek out an ideal partner for your personality. After you take the quiz, Damona will email you advice to date more effectively using your newfound self-awareness. She promises no spam, only relevant tips and recommendations for someone of your dating psychology. Damona’s First Date Starter Kit focuses on helping daters come out of their shells. This two-part audio and ebook program is meant for people who are new to the dating scene — maybe because they just got out of a long-term relationship or maybe because they’ve never dated before. Whatever your situation, Damona wants to make dating more accessible to newcomers. Her seven secrets to land a flawless first date come in a handy digital reference guide as well as an audio version so you can take her advice with you wherever you go. “The thing I appreciate most about Damona is her ability to give compassionate, yet objective and targeted, advice in a way that makes you see things in a new and clear light.” — Sara O. of Washington D.C. This is your own personal secret sauce to introductions. Through the Dating Site Seduction System, Damona advises daters, specifically women, on how to get noticed by the right person. Many singles have found her step-by-step guidance to be transformational. Damona’s dating playbook accelerates the love lives of the dedicated readers who take her lessons to heart. This package includes access to 30 days of instructive content including videos, audios, tutorials, and tips as well as lifetime access to a private Facebook group where singles can ask Damona questions and support one another on the way to love. For the past four years, Damona has delivered seasoned dating advice on her radio show and entertained a global audience with her lighthearted, yet knowledgeable, tone. Every week, Dates & Mates studies, trends, headlines, celebrity gossip, and other newsworthy content. Damona’s co-host, Ray Christian, is the Founder and CEO of Textpert, a platform for daters to receive crowdsourced relationship advice. 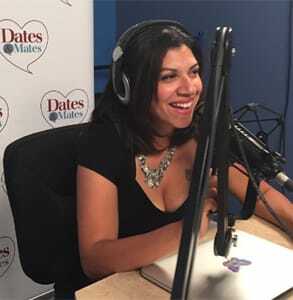 The Dates & Mates radio show features compelling content that empowers singles to change. On their show, Damona and Ray have interviewed leaders in the dating industry like Justin McCleod, CEO of Hinge, and Julia Spira, an online dating guru. The radio show focuses on love in the modern world and covers many hot topics including interracial dating, texting tips, and fantastic first dates. If you have a question for the radio hosts or guests, you can tweet her, Facebook message her, or post it to Textpert. Also, anyone can call in with dating questions using this number: (800) 748-5796. An operator will direct your question to Damona, and she may even answer you live on the air! After over a decade coaching singles, Damona has perfected her craft and become an authority on online and in-person dating. Her online programs and radio shows reach thousands of people worldwide. This certified dating coach has single-handedly developed strategies, tips, and guides that give daters a step-by-step process to land a lasting relationship. Every success story of long-term love and renewed confidence reminds Damona why she got into dating coaching — to help people reach their dating potential. Damona’s accelerated dating programs put singles on the fast track to love. Damona’s can-do attitude inspires singles to take action, and her experienced dating stratagems can change the course of their love stories in a hurry. Whether you’re a 20-year-old first-time dater or a 40-year-old divorcee, her insightful advice about flirtation and attraction applies to people of all ages, races, temperaments, and backgrounds.